One color postcard with an undivided back. 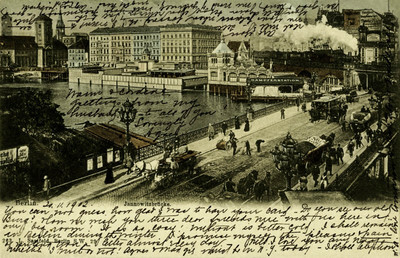 The postcard was published by L. Saalfeld in Berlin, Germany. You can not guess how good it was to have your card – Do you see our old Burg? How we wish you three dear friends were with us here in our big room! It is so cosy! Weather is better cold! I shall remain in Berlin during the winter. I promise myself the pleasure & pain of writing you a letter almost every day. Nell. I love you anyway [illegible]. Agnes & Mattie will be in NY today. I shall telephone at a line tomorrow and ask about [illegible]. / Are you real well? Tell me your plans when formed. Oh? I want to see you all again when you return. Same with girls. Be good and send me word of yourself. With your permission a good night kisses. Agnes / Warm & [illegible] greetings from my husband – to all of you! Lovingly Agnes.